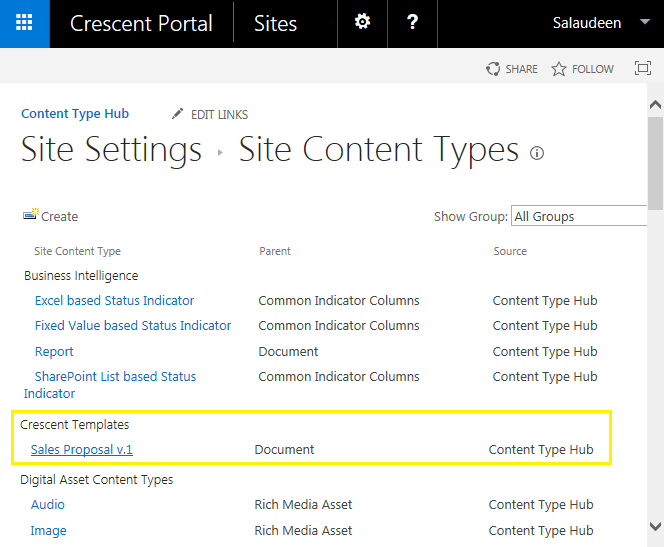 Content types that we create in one SharePoint site collection should be published from Managed metadata content type hub in order to make the content type available in all other site collections which consume Managed Metadata Service application. 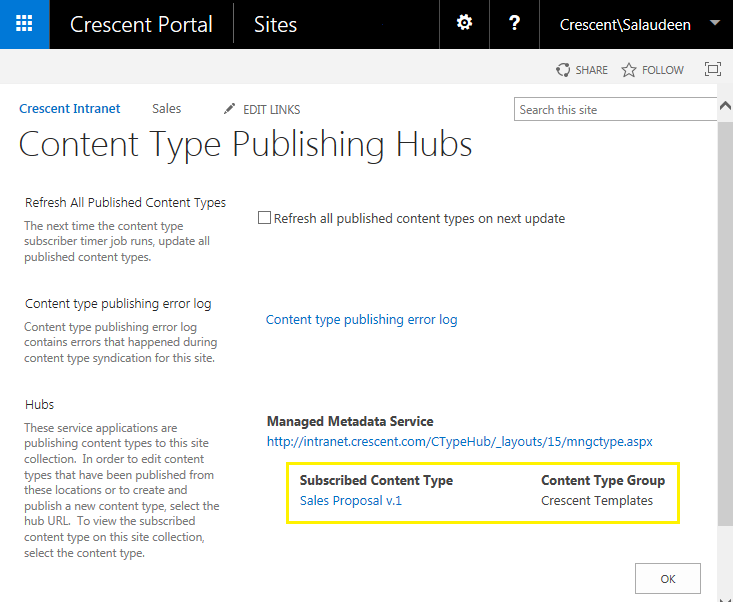 How to publish from content type hub in SharePoint 2013? Select the content type that you would like to publish. In content type settings page, click on "Manage publishing for this content type" link. From this page, you can publish a content type by selecting "Publish" and clicking on "OK". Also, If you make any changes to an existing published content type in content type hub site, you should republish the content type for the changes to take effect. Likewise, if you no longer want your content type to be available, you can unpublish the content type. (unblishing will not remove the content type in use from a subscriber sites). All published content types become available in site collections of consuming web application after the content type hub and content type subscriber timer jobs run. Now, your content type should be available for use in subscribed sites. If the content type publishing activity is too frequent and repeating, we can automate it with PowerShell. 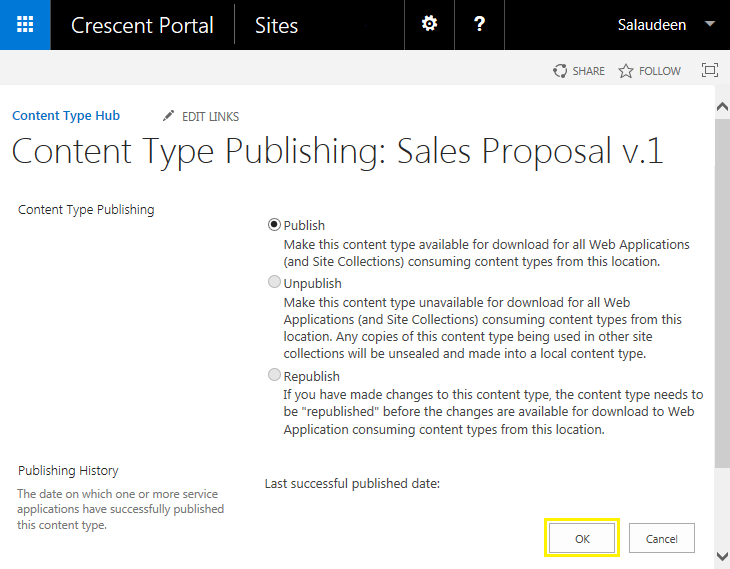 Lets publish the content type in SharePoint using PowerShell. How about Publishing all Content Types from a Content Type Group? Here is the SharePoint PowerShell to publish content type. I wanted to find out if there is a script to publish ALL the content types and not just by groups. Just remove the "Where" part.